I am attempting to insert some records on a custom object that requires a value in the Time Received field, of type Time. Within an existing record (created manually) the value inside the detail page, as well as within a report, appears to be in HH:MM _M. I've been unable to find clear documentation on the specifics of inserting values to these fields via API. Their field type doc does not clearly explain how to insert without error. 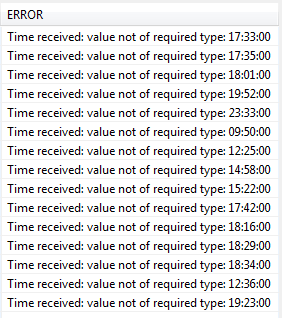 I have verified at my DE that Time format in csv 14:40:00 inserts the record correctly. It shows as 2:40 PM on the record. I will need to confirm it, but to best of my knowledge in data loader and any sort of API calls, you need to use full API format, i.e. 14:40:00.000 in your case. I will work with our doc writer to clear this up in the docs. Thanks! Not the answer you're looking for? Browse other questions tagged custom-field data-loader time or ask your own question. Can I upsert with the Data Loader using different fields for existing and new records? Why is 'Data Type' not defined on my custom field? Is it possible to insert value for required field without value in dataloader?